This year, DC is finally beginning to shake its reputation as a stodgy city full of nothing other than out-of-the-box steakhouses and grand monuments. At its core, the city is a patchwork of neighborhoods, each with a different vibe, and many home to outstanding bars and restaurants.The neighborhoods on this list were selected based on their concentration of varied, creative, and high-quality food destinations -- places where you can walk down the block and be spoiled for choice. 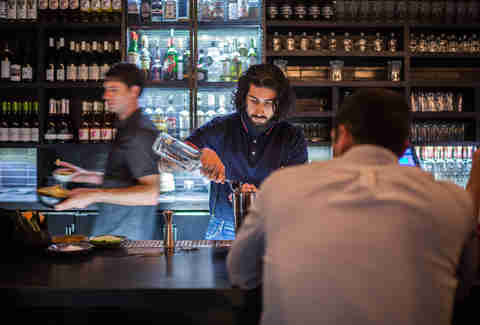 And yes, even in popular neighborhoods excluded from this list (our apologies to places like Petworth and Navy Yard), there are a couple of worthwhile spots to grab a drink or a meal. We just chose outstanding environs to find a meal, whether it's the packed dining rooms of Shaw or gems in the alleys of Georgetown. Calling the sleek, upscale CityCenter a neighborhood is a stretch, though the restaurants in and around this planned development have definitely increased its overall credibility, and in a few years, it very well may inch up higher on this list. 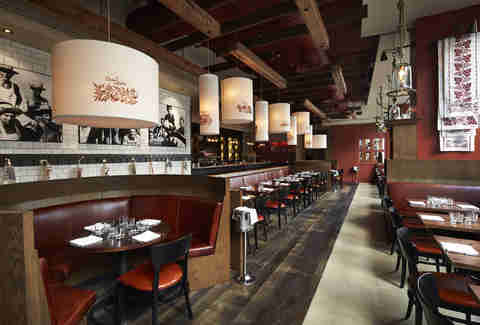 One of the premier spots is the airy and sophisticated (but not stuffy) DBGB bistro from French chef Daniel Boulud. New York’s famed Momofuku ramen bar has arrived in the complex as well, along with an outpost of its sister bakery Milk Bar. And while not technically in the CityCenter development, Fabio Trabocchi’s casual(ish) Casa Luca opened nearby in 2013, serving up homemade Italian fare that’s a couple notches less pricey (but not less quality) than Fiola or Fiola Mare. There’s also serious luxury shopping to occupy you before and after dinner, so that's a plus (or a minus, depending on the state of your bank account). Bloomingdale is a frontier of some sorts, a result of the eastward expansion of the U Street and Shaw growth, and the area is home to neighborhood restaurants that won’t break the bank. Its best representative is The Red Hen, where bowls of comforting sausage rigatoni fly out of the kitchen alongside rustic yet refined Italian appetizers, entrees, and interesting wines. 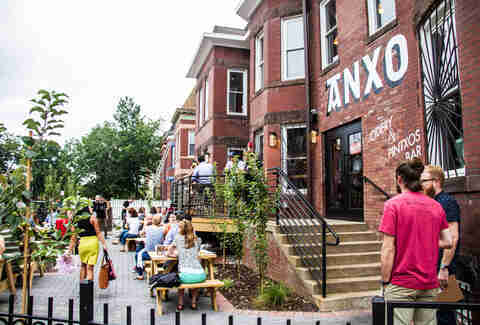 You’ll also find ANXO Cidery & Pintxos Bar, a Basque-style restaurant that finally opened this summer after much anticipation. For something more low-key, hit up Boundary Stone Public House for wings, burgers, fried pickles, and a big selection of whiskey and local beer. Cleveland Park has been the victim of some high-profile restaurant closings over the past few years (Palena, Dino), leaving some middling options in their wake. Still, the mostly residential neighborhood has also managed to retain a few bright spots and add some new blood as well. 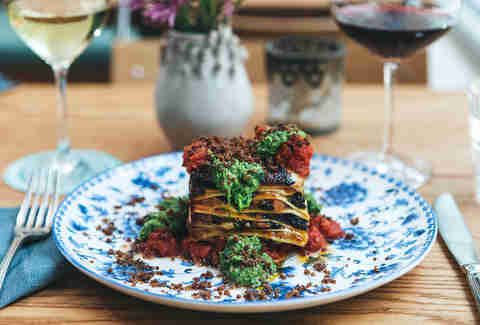 Chef Marjorie Meek-Bradley has expanded to other parts of the city (Smoked & Stacked, Roofers Union) but still turns out delicious seasonal fare at the intimate Ripple, her first project in DC. Newly opened Bindaas, from the brains behind Rasika, showcases tasty Indian street food and creative cocktails in a lively setting. Duke’s Counter, a spinoff of Duke’s Grocery in Dupont Circle, set up shop this summer across from the National Zoo with an English-tilting menu of burgers, sandwiches, and plenty of beer and cocktails. And anyone who makes the short walk north to Wisconsin Ave will be rewarded with a trip to 2 Amys, a sterling example of Neapolitan pizza in DC. If you’re looking for good eats in Columbia Heights, make a beeline for 11th St. That’s where you’ll find the white-hot Bad Saint, recognized nationally and within DC for its outstanding (and sometimes "out there") Filipino food. The trick is getting in -- there are only 24 seats, which along with its reputation, creates plenty of long lines. 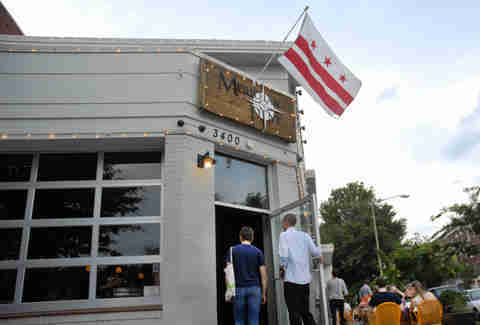 Nearby Meridian Pint helped nourish the craft beer revolution in DC, and serves up classic pub food and bar snacks, although with many vegan, vegetarian, and gluten-free alternatives. The fiery Lao food and sticky rice at Thip Khao is a destination as well -- adventurous eaters will appreciate the snakehead fish entrees when available. The H St corridor is an interesting case. It’s off the beaten path, not as crowded as the busiest parts of DC, and has been developing in fits and starts over the past few years. The recently opened streetcar may be a joke among locals, but the neighborhood's small restaurants have plenty to be proud of. Toki Underground’s ramen often draws hour-long lines, and chef Erik Bruner-Yang’s Maketto is the place to be for Taiwanese cooking like fried chicken & bread and dumplings. The share plates and cocktail menu at Sally’s Middle Name change frequently and with the season, which makes every visit a new experience. DC’s oldest neighborhood is full of cobblestone streets and historic buildings that exude charm. More importantly, it’s also seen an uptick in quality restaurants recently, restoring much-needed balance to the crop of mediocre venues catering to tourists and college crowds around M St and Wisconsin Ave NW. 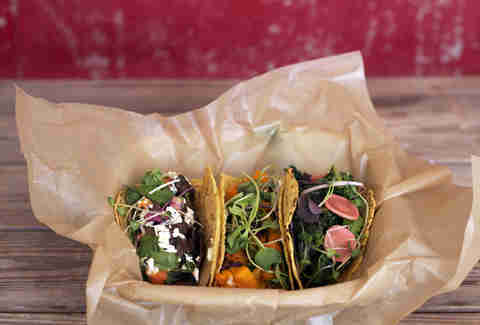 The approachable, relaxed French menu at the quaint Chez Billy Sud is a quintessential Georgetown experience, and Chaia’s flavorful farm-to-table vegetable tacos are fuel for a day of shopping or an inexpensive bite before a night out. For a top-notch experience, it’s hard to beat the seafood-inspired Italian cooking at the elegant Fiola Mare, where plates of lobster ravioli and grilled fish cut no corners. Dupont Circle isn’t the hippest, flashiest new neighborhood, but that's part of what makes it so attractive. 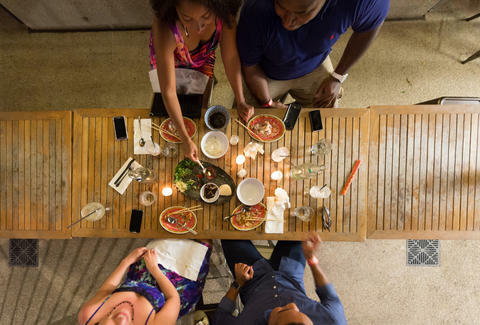 Not every meal experience should involve navigating three-hour wait times and crammed tables. It can get a bad rap for being a little worn around the edges, but look past the bevy of fast-casual restaurants and college bars, and you’ll find plenty to get excited about. 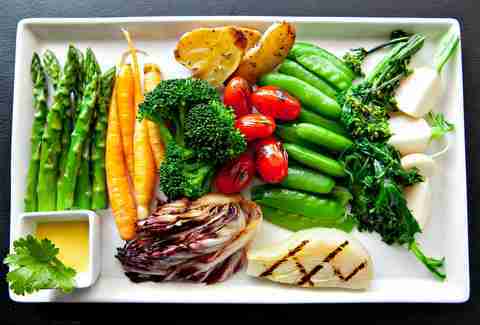 Restaurant Nora, open since 1979, holds the claim as America’s first certified organic restaurant. 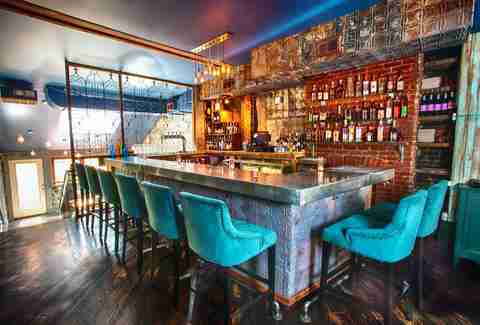 The secluded garden at Iron Gate and its small plates and wine list offers a calm retreat from the hustle of nearby Connecticut Ave, and Hank’s Oyster Bar evokes trips to New England with its lobster rolls and seafood dishes. Travel a little further, and you’ll find the Greek-inspired Komi, which serves a lengthy and pricey tasting menu that consistently wins over critics and diners. In the shadow of Capitol Hill, Barracks Row manages to mix a Washington political feel with a more laid-back community atmosphere. The stretch of 8th St NE south of Pennsylvania Ave is dotted with some of DC’s best restaurants, including the popular no-reservations Rose’s Luxury, Eastern European small plates and drinks (rakia, anyone?) at Ambar, and the $250-a-person decadence of Pineapple & Pearls. So far, the price seems to be worth it, if you can snag a table. 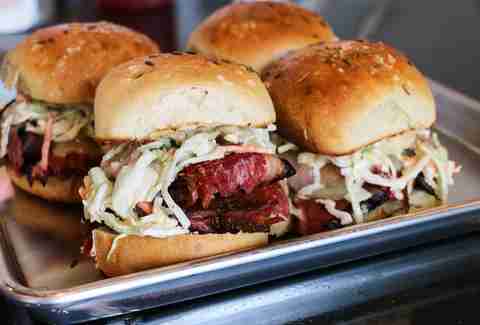 The rustic American fare at The Garrison makes for a winning celebration dinner, too. Bayou Bakery is also a popular hangout, thanks to its delicious New Orleans fare. The colorful row houses and neighborhood restaurants of Adams Morgan feel so DC in the best way imaginable. Strolling down vibrant 18th St affords a variety of options far beyond jumbo-slice pizza (although hey, there’s certainly a time and place for it) and dive bars. 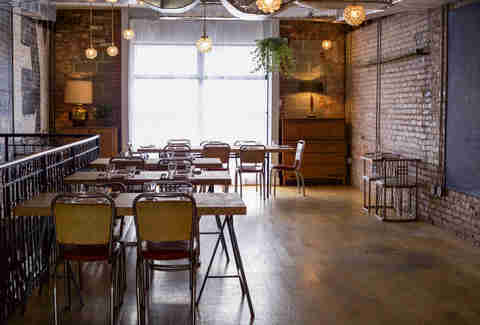 The Diner or nearby Tryst coffee shop are perfect for elevated cheap eats and people watching, and beer lovers will enjoy the selections at vegan-friendly barbecue joint Smoke & Barrel. Adams Morgan can also hold its own with the city’s top-rated dining destinations thanks to the French-influenced meals at Mintwood Place and nationally recognized Mediterranean cooking of Tail Up Goat. Before there was Shaw, there was Logan Circle, and the boom of the 14th St corridor restaurant scene. It’s impossible to walk the stretch from Rhode Island Ave to U St NW and not stumble upon great restaurants, many with international flair, and in this case, there is both quantity and quality. Start with Estadio, where Spanish drinks and tapas evoke Madrid’s best watering holes, then mosey up the street and settle into Compass Rose, a highlight of international eats inside a quintessential DC row house. End with Stephen Starr’s Le Diplomate is a slice of Parisian charm in a remodeled laundromat, serving classic plates like steak tartare and raw seafood towers. Just a short walk from the National Mall, the Penn Quarter and Chinatown neighborhoods have a wealth of restaurants of all sorts... just don’t expect great Chinese food. There are quick, cheap options like ramen at Daikaya (or choose the upstairs izakaya for fantastic Japanese small plates and cocktails) and nearby Bantam King, or sandwiches at Red Apron Butcher. 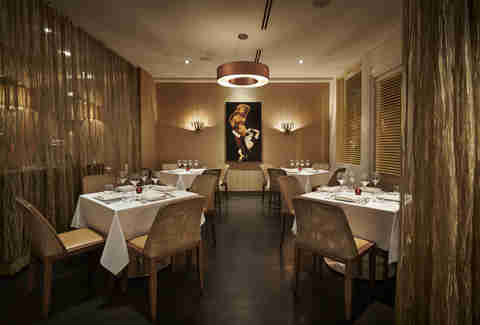 The fine-dining Indian food at Rasika is not to be missed. Penn Quarter is also the hub of chef José Andrés’ restaurant empire, and the innovative small plates at Zaytinya, Oyamel, Jaleo, and China Chilcano are the spitting image of quality and consistency. High rollers can seek out the lavish minibar (plan way, way ahead! ), one of the country’s premier and most revolutionary tasting menus. Shaw has been the city’s white-hot dining neighborhood for a few years now, thanks to all of the development that’s helped erode its previous reputation as a rundown part of town. 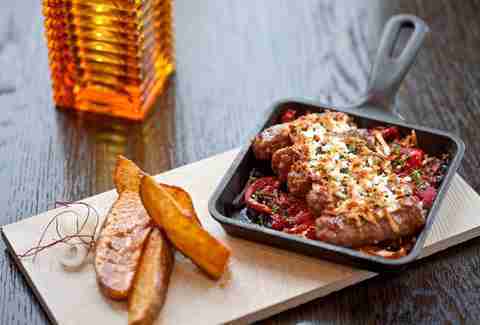 Dining options skew trendy and range from mezcal flights and Mexican fare at Espita Mezcaleria to shareable modern French dishes at Cedric Maupillier’s Convivial. There’s also the wood hearth mid-Atlantic cooking at The Dabney, perfect for a cozy evening. The pizzas at newcomer All Purpose have also drawn rave reviews. One downside: Shaw’s most buzzy restaurants are also known as much for their long wait times and hard-to-nab reservations as the food. Not to worry though, as there are plenty of bars to linger at while passing the time if you forgot to plan ahead. Travis Mitchell is a freelance writer for Thrillist Food & Drink who has been exploring and writing about DC bars and restaurants since 2007. Follow @travisjmitchell on Twitter and Instagram.